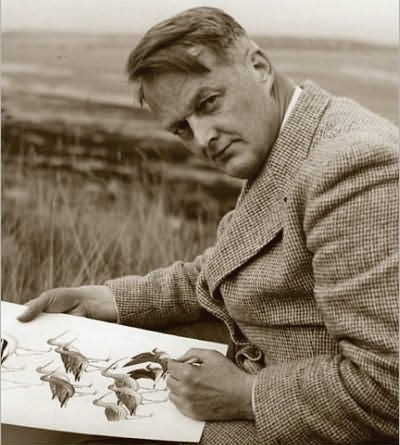 On July 28, 1996, ornithologist and artist Roger Tory Peterson died in Old Lyme. From age 11, growing up in New York, Peterson was active in the Junior Audubon Club and his interest in birds and artistic talent led him to study art at the Art Students League and then the National Academy of Design. While Peterson was teaching art in Massachusetts, the paintings he did as a student came to the attention of an editor at Audubon magazine who suggested he publish a book. In 1924, Peterson’s Field Guide to Birds, Including All Species Found in Eastern North America was published and became an instant success. Written for the amateur birder, the book offered simple illustrations and grouped the birds by appearance rather than species. Peterson was able to leave his job in Massachusetts and settled in Old Lyme where he set up a studio. Field Guide to Birds sold more than five million copies and Peterson continued to write and edit books on birds and nature, 50 in all, as well as paint and exhibit his artwork in galleries and museums.